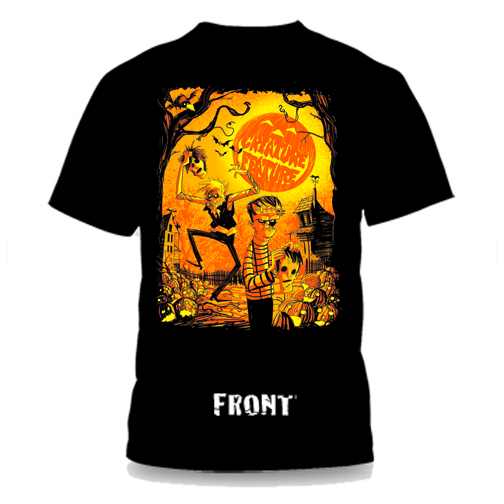 Brand New Everyday Is Halloween 2013 Limited Edition T-shirt! 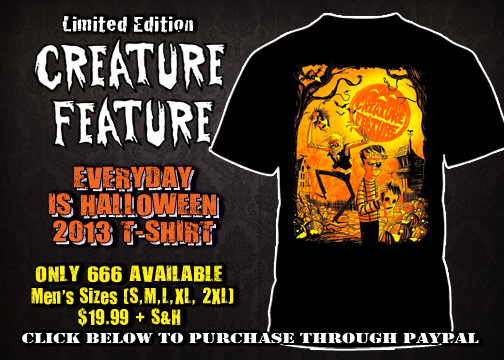 I’m pleased to announce our third annual Creature Feature “Everyday Is Halloween” T-shirt just in time for everybody’s favorite holiday. We all wear masks and this shirt depicts what Creature Feature really looks like on that one special day of the year when they can remove their fleshy human masks and show their true monstrous faces. The shirt is single sided and limited to only 666 pieces. They are $19.99 (plus shipping & handling) and come in mens sizes: Small, Medium, Large, X-large, & 2X). Artwork by the amazing Thomas Boatwright. All shirts will be shipped on the last week of October. Click the links below to order your shirt today through Paypal. I like it when it rains, it means it’s going to make it that much easier to go digging around in the graveyard at night.